Before I tell you about banana bread, I have to tell you about my battle with baking. After 8 years of failed baking attempts, I have finally figured out what my problem was -- my entire life, I’ve been measuring flour all wrong. I would dunk the cup into the bag of flour and smooth it out on the side of the bag to make it even. When Jason saw me do that, he gasped, and whipped out a scale (the accurate person that he is, he always weighs his ingredients when making bread). He had me measure the flour my way and weigh it, and then measure it the correct way (using a knife to level the flour) and weigh that. Turned out I was putting about 25% more flour into all my failed baked goods. What can I say... I am measuringly challenged. What still puzzles me is that even using the measuring cups correctly, gets me more than 4.5 oz of flour per cup (the official volume to weight conversion). So I give up on measuring cups entirely, and now I just weigh my flour. If anyone has any idea what I am doing wrong, please let me know. I have made my share of banana breads in the past that all turned out pathetically dry in spite of overly ripe bananas and all those other tricks cookbooks tell you about. I wish they devoted as much time to the explanation of how to measure flour. But this time it was going to be different – not only did I finally learn to measure flour, but I was armed with undisputedly the “the best in the world” banana bread recipe from The Seasonal Cook. I weighed the flour, I froze my bananas to turn them into liquid mush, I even toasted the walnuts (something I often fail to do). But just as I started to get my ingredients ready, I realized that I was missing the wheat germ, dates, and the walnut extract. Oh no! In my panic of not getting that “best in the world” banana bread after all, I dumped some chocolate chips into the batter hoping that they will make a suitable replacement for the 3 other ingredients. Between Part 1 and Part 2 of the banana bread saga, the batter went in the oven, made the whole house smell wonderful, came out of the oven, cooled on a wire rack, got wrapped in plastic, frozen, traveled to the Berkshires, and defrosted on the counter for 4 hours. I couldn’t wait to find out how the bread turned out, so we had it for the first breakfast of our trip. In spite of my wild substitutions, and mishandlings, it came out great – moist, nutty, and delicious. I can’t complain about going from the worst banana bread in the world to second best. But alas, it was only second best… And if there is one thing you’ve probably learned about me by now is that I never settle for anything but perfection. Every time I had a chocolaty bite I couldn’t stop thinking how chewy and musky the dates must have been. Well, there is always next time. 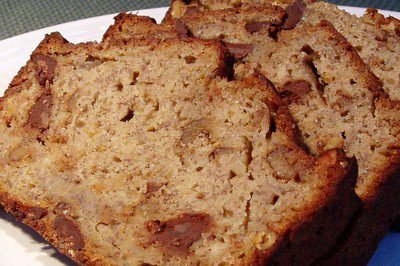 I might go and buy some bananas now, and maybe by the time they finally ripen, I would have lost those extra 10 Lbs (that I keep carrying around since Christmas) and would be ready for the best banana bread in the world. Great post. I did the same scoop/weigh experiment a few years ago, found the same 25% difference. That's a LOT of flour! And pancakes, cookies, cakes, EVERYTHING with flour has been SO much better ever since. It's the "one lesson" I'd give to every new baker. I sift my flour before measuring and that means I don't need to weigh it. Does anyone know the weight difference between these two? Great post! You are very right--weighing the ingredients is what the professional bakers do for just the reasons you mentioned. Sorry to say, sifting the flour is NOT a substitute for weighing it. I strongly recommend to you Alton Brown's book called "I'm Just Here For More Food". It is all about baking methods and was the beginning of my enlightenment as a baker. His buttermilk pancake recipe is the only one I use now. I have a few posts on this stuff on my own blog. Maybe you could do a feature on "sides that go well with fish". Thanks for Alton Brown's book recommendation! I could use a good baking book. About sides that go well with fish... my 2 recent favorites are mashed celery root and braised fennel. The best way to measure flour without weighing is to lightly spoon the flour into the measuring cup then level off with a knife. The only scooping going on should be with the spoon. It depends on who is doing the measuring, and also on the type of flour, but the difference between 1 cup of flour sifted and 1 cup of sifted flour is supposed to be about 30 - 40 grams.